With our immense domain expertise, we are involved in offeringCompact Cotton Yarnto our renowned clients. This Yarn is fabricated by our associated vendors using supreme class ingredient at par with international standards. Offered product is appreciated for durability, color-fastness and unmatched quality. Moreover, we offer this yarn in different specifications as per the needs of clients at pocket friendly rates for our renowned clients. To maintain the quality standards of our company, we provide a quality assortment of Ne 30/1, 100% Cotton, Compact Yarn for Knitting. The offered yarn is spun using the best quality fiber and advanced technology at vendors’ end in adherence with industry norms. Used to fabricate different attractive dresses and apparels, our quality examiners test this yarn on different quality measures so as to offer qualitative product to our clients. Apart from this, provided yarn is available at industry leading prices. 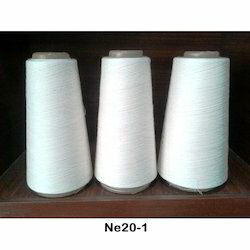 Product : Ne 30/1, 100% Cotton, Compact Waxed Yarn . Fibre : 100% Cotton , Variety Shankar -6. Packaging Details: Packaging Details	Cone Paper	Cone Weight Net	1.89KG Carton	Ocean Worthy 3/5 Ply	Cones per Carton	24 Cones	Carton Weight Net	45.36KG	Pallet Packing	On Request	CARGO	Stuffing	40' HFCL	450 Cartons	20' FCL	188 Cartons. Running with an objective to accomplish diversified demands of clients, we are offering a wide array of Ne 32/1, 100% Cotton, Compact Yarn for Knitting. Our provided yarn is highly demanded in the market for its high strength and smooth finish. Our vendors’ professional spun this yarn using supreme quality fibres and progressive techniques. Apart from this, our provided yarn is stringently tested by our quality examiners so as to offer the best product at clients’ end. We offer this yarn to our clients at nominal prices. Product : Ne 32/1, 100% Cotton, Compact Waxed Yarn . Packaging Details: Packaging Details	Cone Paper	Cone Weight Net	1.89KG Carton	Ocean Worthy 3/5 Ply	Cones per Carton	24 Cones	Carton Weight Net	45.36KG	Pallet Packing	On Request	CARGO	Stuffing	40' HFCL	450 Cartons	20' FCL 188 Cartons. With our in-depth knowledge and experience, we are engaged in providing a superior range of Ne 36/1, 100% Cotton, Compact Yarn for Knitting. Our provided yarn is designed by our vendors’ professionals using progressive technology and optimum quality components in line with industry norms. Widely used in textile industries, this yarn is highly praised in the market for its compact design, high strength and smooth finish. Product : Ne 36/1, 100% Cotton, Compact Waxed Yarn . Packaging Details: Packaging Details	Cone Paper	Cone Weight Net	1.89KG Carton	Ocean Worthy 5 Ply	Cones per Carton	24 Cones	Carton Weight Net	45.36KG	Pallet Packing	On Request	CARGO	Stuffing	40' HFCL	450 Cartons	20' FCL 188 Cartons. We are instrumental in offering incomparable range of Ne 40/1, 100% Cotton, Compact Yarn for Knitting. Under the guidance of our vendors’ professionals, this yarn is spun using optimum quality cotton fibers and sophisticated technology. The offered yarn is available in different thickness and lengths to cater the needs of clients. Used to fabricate different attractive and stylish apparels, we offer this yarn to our clients at industry leading prices. Product : Ne 40/1, 100% Cotton, Compact Waxed Yarn . Product : Ne 30/1, 100% Cotton, Compact Yarn . Packaging Details: Packaging Details	Cone Paper	Cone Weight Net	1.89KG Carton	Ocean Worthy 3/5 Ply	Cones per Carton	24 Cones	Carton Weight Net	45.36KG	Pallet Packing	On Request	CARGO	Stuffing	40' HFCL	430 Cartons	20' FCL	180 Cartons. Product : Ne 40/1, 100% Cotton, Compact Yarn . Looking for Compact Cotton Yarn ?